The plantar fascia is the largest ligament in your foot. It’s basically a huge sheet of collagen that attaches to the bottom of the heel bone and then goes all the way across the bottom of your foot where it fans out across the ball of the foot and finally attaches to the joint supporting structures at the bases of the toes. The term plantar just means “bottom of the foot.” When doctors talk about the “plantar surface” they’re referring to the surface of the foot that faces the ground. If you look up the term “fascia” probably find one of two definitions. The first definition is one used in home construction. In that case “fascia” is defined as a wooden board or flat piece of material covering the ends of rafters. If you ever get the roof replaced on your home, the roofer will point do some of the trim underneath the roof line and refer to it as the fascia. In that sense, fascia is basically a external covering. The second definition of fascia is the one that refers to anatomy. In that case fascia is defined as a sheath or thin fibrous tissue enclosing a muscle or organ. Well, that makes sense based on his experience with home construction. But I then explained to him that yes, the plantar fascia does in fact serve as an outer protective layer, or in a sense a covering of the four layers of muscles on the bottom of the foot. However the plantar fascia is actually much more than just a protective covering. It is also a structural element in the foot. The plantar fascia helps support your arch because it acts like a bow string on the bottom of your foot pulling the arch tighter. It also increases tension on the big toe when you are running and get ready to push off. So it’s not really accurate to think of the plantar fascia as just a protective covering. It’s much more than that. Which helps explain why I think it’s a terrible idea for you to have surgery to cut the plantar fascia. But that’s a different lesson entirely. Now that you understand what the plantar fascia is, let’s talk about plantar fasciitis. The term “-itis” means inflammation. If you have plantar fascia “-itis” you have inflammation of the plantar fascia. How do runner’s get plantar fasciitis? Plantar fasciitis begins with some minor injury to the plantar fascia. Basically it’s where you have a very minor sprain of the plantar fascia ligament. 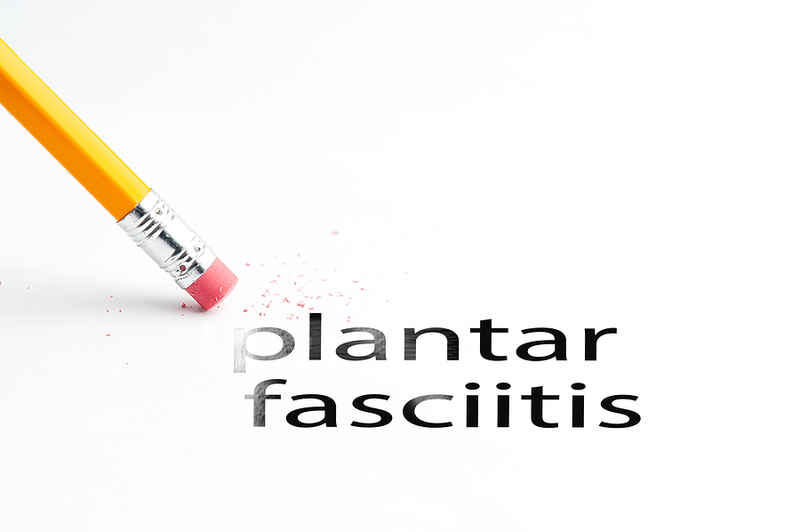 I think many doctors and many authors suggest that runners get plantar fasciitis because of an overuse syndrome where they “over-use” the plantar fascia. But I don’t really believe that’s true for most runners. Maybe some specific workout you did put an excess strain on the plantar fascia and it got flared up. Maybe you were doing a series of hill repeats. Maybe your form fell apart and you applied to much stress to the plantar fascia when you were doing speed work. Maybe the inflammation started when you stepped on one of your kids Legos while you were barefoot. Regardless of the initial cause of inflammation, plantar fasciitis persists in runners because you continue to apply strain to the plantar fascia ligament every time you walk on it. You get swelling around the plantar fascia and you get swelling where the plantar fascia attaches to the bone. When you step on that swollen and inflamed area it causes more stress and strain and stimulates more inflammation. So it takes some initial minor injury to the plantar fascia and then a cycle of inflammation in response to pain that causes plantar fasciitis in most runners. Running does not cause plantar fasciitis. I don’t believe runners get plantar fasciitis because they run too far. I don’t believe runners get plantar fasciitis because they run too fast. I don’t believe runners get plantar fasciitis because they run too much. And I don’t believe runners have to stop running to heal plantar fasciitis. What does it take to heal plantar fasciitis? We are going to make this section really clear and really simple. If you search for plantar fasciitis treatment you’re going to get thousands of different treatment options. It doesn’t take thousands of different things to treat plantar fasciitis. You don’t have to take pills every day. You don’t have to do 10 different stretches every day. You don’t have to buy a whole bunch of different stretching gizmos, shoe inserts or arch supports. There are really only three things required for most runners to quickly heal a case of plantar fasciitis. So let’s keep it simple and focus on what really works. 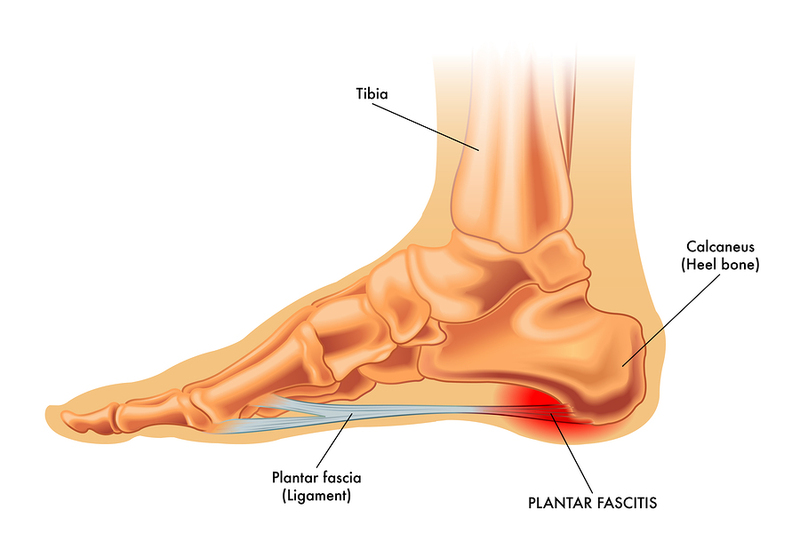 Remember by definition plantar fasci-“itis” means you have inflammation of the plantar fascia. The process of inflammation leads to the build up of inflammatory fluid on the bottom of your heel and arch. When you step on it, you’re basically squishing all of the tissue that is already stretched out and distended by that additional fluid. Of course that hurts. And when you get pain you get more inflammation in response to that painful stimuli. All of that inflammatory fluid collecting around the bottom of the heel and the arch needs to stop if you want to get better. So the first thing you want to do is decrease the inflammation. Cryotherapy is the lowest risk and likely the most effective way to stop that inflammation in runners. 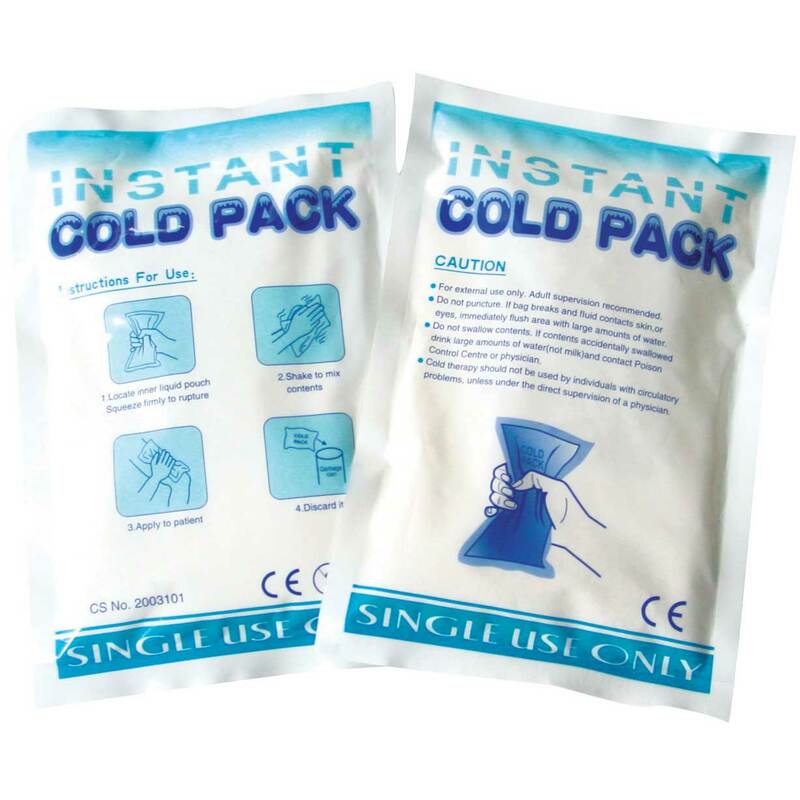 “Cryotherapy” just means “cold therapy.” Some runners like to rest their foot on an ice pack. Other runners prefer to take a more progressive approach and do contrast bath soaks. Although there are many different ways to stop the inflammation you have to understand that is step number one when you are a runner with plantar fasciitis. If you’ve had plantar fasciitis for a long time and you got confused because some doctor told you that you don’t really have inflammation going on in your foot, then you don’t actually have plantar fasciitis. If you don’t have inflammation, you don’t have plantar fasciitis…you have the wrong diagnosis. If you’ve had what you think is plantar fasciitis for a couple of years then you probably don’t have plantar fasciitis anymore. In that case you probably have something called plantar fasciosis. The details of that or not really important. Because if you are a runner and you think you have plantar fasciitis and you do the right treatments you will get better. If you do the right treatments and you don’t get better, then you probably have the wrong condition. You have nothing to lose by trying these treatments to see if you will get better. Even if you don’t get better that will be more useful information for your doctor to use to come up with the correct diagnosis. That DOES NOT mean you have to stop running. Regardless of the initial cause, something you did applied to much stress to the plantar fascia. That amount of stress actually caused a strain or sprain of the plantar fascia ligament. So it just stands to reason that you need to decrease the amount of stress and strain on the plantar fascia ligament if you want to keep running. If you don’t hear anything else from this lesson, you need to hear this: you need to decrease the amount of stress and strain. But that does not mean you have to stop running. You just have to decrease the stress and strain on the plantar fascia ligament enough so you can keep running. These are the exact sort of techniques I teach to physicians when I lecture at medical conferences on Runner’s Heel Pain. In 2018 alone, I have been invited to teach doctors about Runner’s Heel Pain at medical conferences in Lake Tahoe, Las Vegas, San Francisco, Seattle, Reykjavík Iceland, and Hawaii. Keep in mind, at all of these conferences I’m actually teaching physicians how to treat this condition while runners continue to run. Most of them don’t really know how to do that. So if you seem confused because you haven’t been able to find a doctor who will help you run while you’re trying to heal your plantar fasciitis, don’t let it surprise you. There are many different ways you can decrease the stress and strain on the plantar fascia ligament. 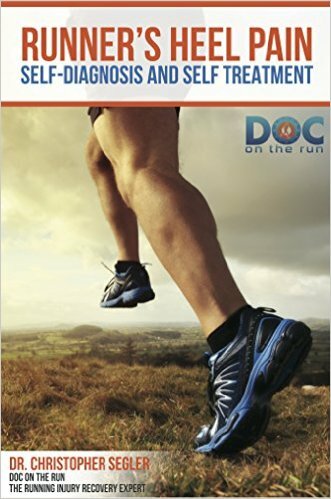 We cover all of those in the book on Runner’s Heel Pain, and also teach all of the most effective methods for reducing the stress on the plantar fascia when you run in the Runner’s Heel Pain Course. As long as you can decrease the stress on the plantar fascia enough so it can heal, it will heal. And if you do enough of the right things you can decrease the stress on the plantar fascia enough so that it will heal while you’re continuing to run. About a year ago I got plantar fasciitis myself. I wanted to experiment with this so the only thing I did, the only treatment at all, if you want to call it a treatment, was that I started running all of my runs on the right side of the street to make sure I could supinate my foot and decrease some of the stress to the plantar fascia. In two weeks my plantar fasciitis went away. All I did was run on the right side of the road. I want to make sure I have your full attention before we talk about this. Every runner who gets plantar fasciitis has a tight Achilles tendon. In fact in the last 15 years I have only seen three runners who have “normal” Achille’s tendons with more than 10° of measurable dorsiflexion. Again every runner, except for three, every single runner I have seen in the last 15 years has a tight Achilles tendon. Every runner who gets plantar fasciitis has a tight Achilles tendon. Not every runner with a tight Achilles tendon has plantar fasciitis. But you could argue that every runner who has a tight Achilles tendon is on the verge of getting plantar fasciitis. So again, now that I have your attention, the most important treatment to treat plantar fasciitis if you are runner is to stretch the Achilles tendon. You have to make sure that you are doing Achilles tendon stretches that will not apply any additional stress or strain to the plantar fascia. Remember we talked about this earlier. If you want to continue running you have to decrease the stress and strain on the plantar fascia enough so it will heal. If you want to run while your plantar fasciitis is healing, then you need to decrease the stress and strain enough that you can still continue to run, while the plantar fasciitis heals. The last thing you want to do is start stretching the Achilles tendon in some way that is going to apply even more stress and strain to the plantar fascia. But stretching the Achilles tendon is the single most important treatment for runners with plantar fasciitis. Why does plantar fasciitis last so long in runners? There couple of different reasons why runners don’t get better when they get plantar fasciitis. A lot of runners will hear from their running buddies that plantar fasciitis will just go away on its own. That’s not always true. Some runners will read an article online that explain something about plantar fasciitis being “self-limiting.” That also is not always true. But I think the main reason plantar fasciitis doesn’t get better quickly in most runners is that most runners don’t think it’s a big problem. After all, most runners with plantar fasciitis don’t even have pain when they run. You just get pain when you step out of bed in the morning. You may get pain when you have been sitting in a chair at a desk and get up and start walking again, but plantar fasciitis is not really crippling you. Plantar fasciitis is easy to ignore. If you ignore it, it won’t just go away. How does plantar fasciitis turn into chronic problems in runners? When runners ignore plantar fasciitis and let it go on for months or years, the condition actually changes. The chronic inflammatory fluid that collects around the plantar fascia actually contains degradative enzymes that damage the collagen. Remember the plantar fascia is just a huge sheet of collagen. Over time, the inflammation actually does subside. But when that happens you actually have a different condition. Once the plantar fascia becomes damaged, it actually gets thicker and evolves into a chronic condition called plantar fasciosis. Plantar fasciosis only develops as a consequence of ignoring plantar fasciitis. So whatever you do, don’t just keep running on it thinking eventually your plantar fasciitis will miraculously vanish some day. If you have plantar fasciitis and you really want it to get better, all you have to do is the three things that I just explained to you. And if right now you’re worried that maybe you are going to get (or already have) a case of plantar fasciosis, then you have probably had it a long time and you have very little to lose by trying these three treatments. Decreasing the inflammation, decreasing the stress on the plantar fascia and stretching the Achilles tendon will cure plantar fasciitis in the overwhelming majority of runners. And, most importantly, just like I explain to physicians when I lecture medical conferences, you should be able to run, even while you heal your plantar fasciitis. Like I mentioned earlier there are thousands of different treatments for sale online and which are often sold to you by your doctor in the doctor’s office. But I really and truly believe, and have seen, that almost every runner with plantar fasciitis will get better and can keep running if you can just decrease inflammation, decrease the stress on the plantar fascia and stretch the Achilles tendon. If you do those things and you don’t get better then you may not have plantar fasciitis. In that case you should check out the book I wrote called Runner’s Heel Pain: Self-diagnosis and Self-treatment. Better yet, just sign up for the online course on Runner’s Heel Pain so you can quickly learn exactly what I do when I see runners in person, and how I diagnose the true cause of runner’s heel pain, and exactly what I tell them to do get better and keep running. We’ve put links to them at the bottom of the show notes for this episode. Check those out if you’re confused about whether or not you actually have plantar fasciitis.